Spring has finally sprung here in Maryland. And while Old Man Winter might be clinging on for dear life, the weather will catch up sooner rather than later. Before you know it, the sun will be shining, the weather will be noticeably warmer, the flowers will be in bloom, and barbeque season will be in full swing. People everywhere will flock to backyards, fire up those burger making machines, and relax in the privacy of their own yards. But what if your own yard isn’t very private? Curb Appeal: Of course a new privacy fence will help add to your already stunning curb appeal. Home Value: The return on investment for fencing in Maryland is dependent on the type of fence you install. A wood fence has an average ROI of 50%, while aluminum fences and vinyl fences come in around 65%. And any time you can recoup 50% or more of your initial investment, that project can be considered a good investment. Click Here to learn more. Safety: A fence is a great option for homeowners with small children. A fenced in yard gives your little tike a safe place to play. Great for Pets: A privacy fence is an excellent option for dog owners. These tall fences help keep your pup safely in your yard. Click Here to learn more. Noise Reduction: A privacy fence can act as a barrier for unwanted sound. Wind Reduction: A privacy fence will also help stop those windy days from ruining your next barbeque. Options: Privacy fences are typically built using one of two materials. 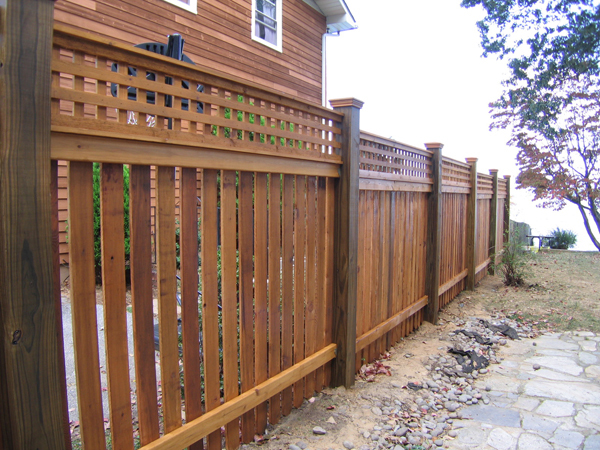 Wood fences in Maryland are still one of the most popular, and one of the most reasonably priced materials used today. Then there is vinyl. Which is best? Well, that is entirely up to you. If you have any questions about privacy fencing, please contact Mid Atlantic Deck & Fence (MAD Fence) today by clicking here or calling 1-800-833-9310. We proudly serve Anne Arundel, Baltimore, Howard, Montgomery and surrounding counties.